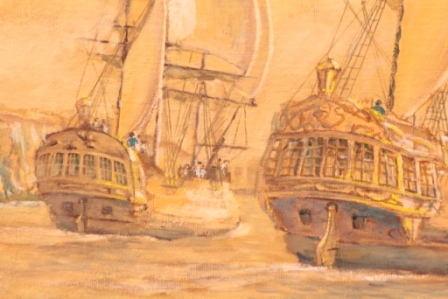 I’m quietly confident no other painting so accurately portrays these two ships or better shows the approach to Botany bay, this is an excellent, timeless investment, I’ll explain in this text, enjoy. 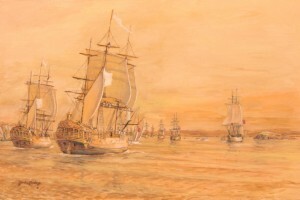 “Lapérouse and the First Fleet” measures 61 x 91 cm (24″ x 36″), oils, available, £3000. ex studio, ex frame. The setting is Botany Bay, South Australia. 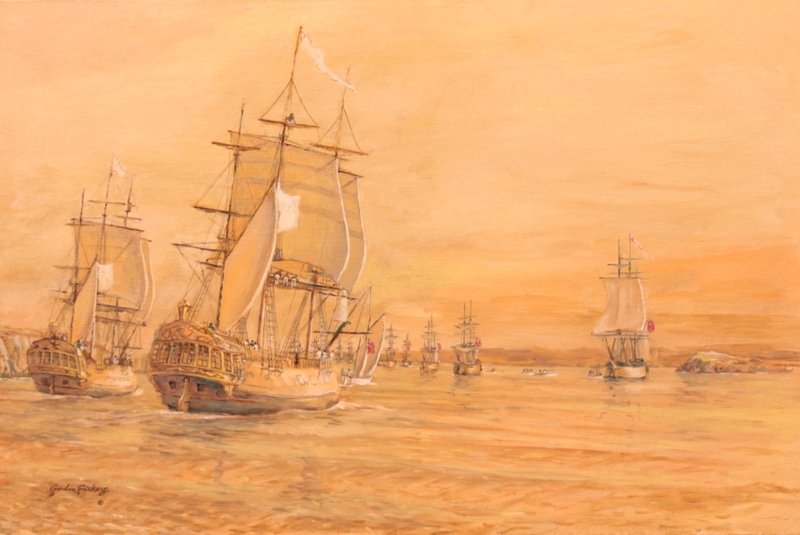 My Lapérouse painting is based among other things on the original chart made by Captain James Cook which I was privileged to have access to at the secured facility, Her Majesty’s United Kingdom Hydrographic Office, Taunton. In addition at UKHO I was given access to water colour paintings made by captains of R N ships for navigational purposes (all made long before the invention of photography) of Botany Bay. I made a very careful and detailed study of the few existing drawings made of Astrolabe and Boussole during the voyage, relating those impressions to what is known about the types of ships they were. 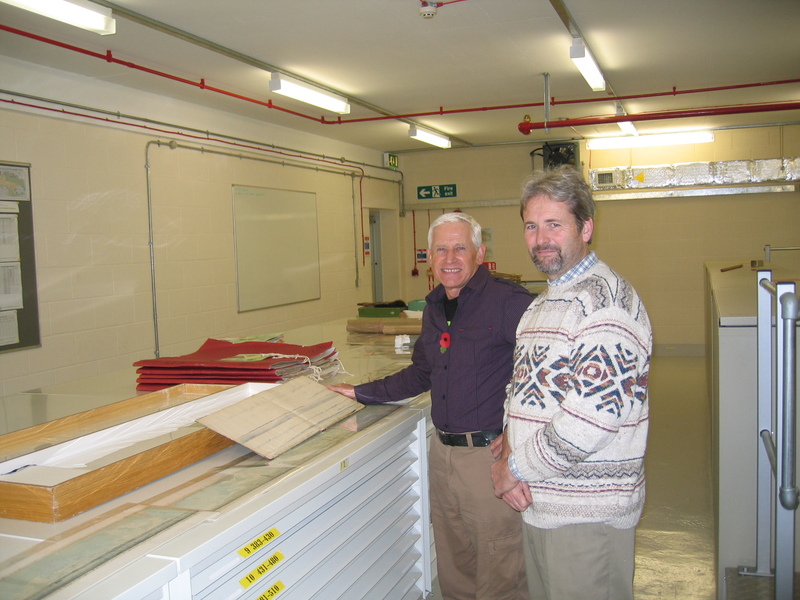 I was privileged to have access to at the secured facility, Her Majesty’s United Kingdom Hydrographic Office. I was greatly assisted by staff of the Musée and members of the Association Lapérouse, Albi, France & Mr. Stephen Best. Further reading, Laperouse & Botany Bay. 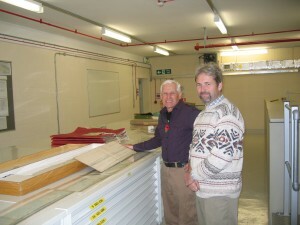 At UK Hydrographic Office with Guy Hannaford showing me “The Coffin”, it’s amazing watercolours by Serres, treasure at UKHO ! My painting is my tribute to the gallant Jean François de Galaup, comte de Lapérouse, of Albi, and his men.